ST KILDA has had little luck with father-son prospects throughout its history, drafting only three players under the rule. In some ways, that could change this year. However in other cases, the same story will be told again. The Saints will have access to Tyson Milne (son of former small forward Stephen) and Jackson Voss (son of former defender Brett) under the NAB AFL Draft rules this year, with both players on Sandringham's under-18 list. Milne is taller than his father, having grown 7cm since the end of last season, but plays in attack like Stephen, who kicked 574 goals for the Saints. Voss, a midfielder and half-back who has shown a dynamic side, is also on St Kilda's radar. But the Saints won't have all the cards fall their way. Possible No.1 pick Noah Anderson's father Dean played 67 games for the Saints (and is now a St Kilda board member) after 83 games for the Hawks, so neither club can take him as a priority selection, while Chayce Black, the son of former Docker and Saint Heath, can only be drafted by Fremantle as a father-son choice. Anderson is a tall and dangerous midfielder with an elite running base and has already starred for the Oakleigh Chargers at under-18 level, while Black is a hard-working midfielder for the Eastern Ranges. The club can’t ask 'What if?' about Fischer McAsey, a tall forward from Sandringham Dragons, given his father Chris played only one game for St Kilda. But he’s another family link for the club. The Saints' crop of eligible and ineligible father-sons are among a large pool of players in this year's draft who will carry recognisable names. Port Adelaide could be set for its first father-son pick since it recruited Brett Ebert in 2002, with premiership player Peter Burgoyne's son Trent and foundation Power member Darren Mead's son Jackson both up for grabs. Mead is a big-bodied midfielder who could project as a possible top-30 pick with a strong season, while Burgoyne is an outside midfielder who has had some injury concerns. Exciting prospect Kysaiah Pickett – known as 'Kossie' – also has links to Port Adelaide, as the nephew of the Power's only Norm Smith medallist Byron Pickett. Hawthorn has access to Scott Maginness' son Finn, Carlton the same for Matthew Hogg's son Mackenzie, Richmond could add another Naish to its list with Chris' son Xavier able to join brother Patrick at the Tigers, and Brisbane triple-premiership star Chris Johnson's son Lachlan can join the Lions. Lachlan played for the Calder Cannons last year but has switched to the Oakleigh Chargers this season, however a battle looms for the talented youngster, given he also qualifies for Essendon's Next Generation Academy. Essendon has also had Tom Hird, son of champion Bomber James, train at the club in recent weeks. He is eligible this year although he's come from a soccer background. Oliver Liberatore, a midfielder from the Cannons, could also join his brother Tom at the Western Bulldogs, where their father Tony won a Brownlow Medal. There is also a group of father-son prospects who were overlooked for the draft last season but are returning to the under-18 competition as over-agers. Mason Fletcher (son of Essendon's Dustin), Tom Graham (son of Hawthorn's Mark), Zac Hart (son of Adelaide's Ben), Daniel Romero (son of Bulldog Jose) and Kyle Dunkley (son of Sydney's Andrew and brother of Bulldogs midfielder Josh) will all come back to the under-18 competition looking to impress. After finishing school in Melbourne and playing for the Oakleigh Chargers last season, Dunkley will play for the Gippsland Power this season. Cats great Garry Hocking’s son will join the Geelong Falcons program next week after living in South Australia and will be under the eye of Geelong recruiters. He is another over-ager who was eligible at last year’s draft. Like every year, there are many near misses – players whose fathers' reached the top level but didn't play 100 games at a club to make their son qualify for the rule. Simon Minton-Connell didn't play enough games at any of Carlton, Sydney, Hawthorn or the Bulldogs for his son Harrison to be eligible. Terry De Koning's 31 games at Footscray wasn't enough for his son Sam to qualify there, meaning he will need to go through the national draft like his brother, Carlton's Tom. Eastern Ranges pair Josh Matthews (the son of former Blue and Fitzroy player Ashley) and Billy McCormack (son of former Lion Brendan), along with Gippsland's Fraser Phillips (son of former Cat Garry) are others whose fathers didn't reach the 100-game mark. West Coast has ties to two West Australian prospects, although the Eagles will not get first call on either. 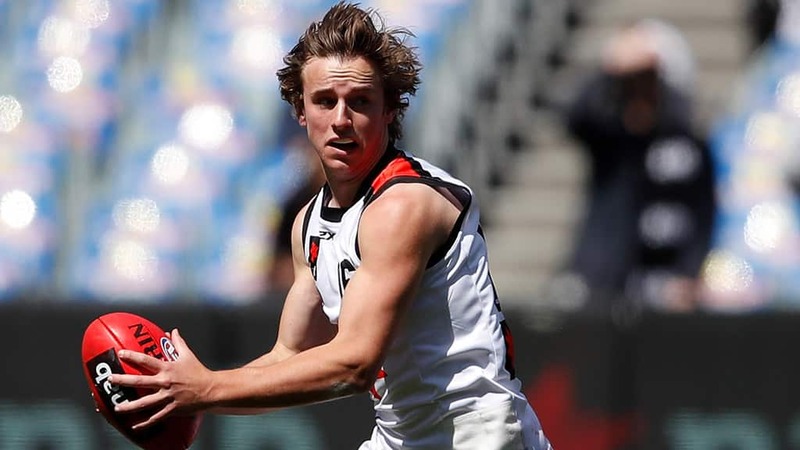 Deven Robertson, considered one of the leading players in his state in 2019, is the nephew of former Eagles skipper Darren Glass, while former Bomber and Eagle Michael Prior's son Jackson, a medium defender, can be drafted this season. Prior didn't play enough games for either club during his career for his son to qualify as a father-son. The same applies for Subiaco's Mitch Georgiades, whose father John played 15 games for Footscray, including a memorable eight-goal debut. There is a smattering of prospects whose brothers have also made it to the AFL. Thomson Dow, younger brother of Carlton's Paddy, is considered one to watch for Bendigo this year and premiership Tiger Jason Castagna's brother Aaron will play for the Northern Knights. Sheldon Ham, the younger brother of first-year Bomber Brayden, is at the Falcons, Zac Skinner, whose brother Sam is on Brisbane's list, will line up for Gippsland, and Todd Garner, the younger brother of Port Adelaide's Joel, will play for the Eastern Ranges. Garner is eligible to join Hawthorn as a Next Generation Academy player given his indigenous background. The Eastern Ranges are full of strong football bloodlines. Jarrod Gilbee is the nephew of ex-Western Bulldog kicker Lindsay, while former Richmond rover Dale Weightman has two nephews at the club – Connor Weightman and Will Parker. Parker is also the nephew of Geoff Parker, who played at Essendon and is now Port Adelaide's recruiting manager, and a cousin of ex-Cats and North star Leigh Colbert. Isaac Grant, from the Greater Western Victoria Rebels, is the nephew of Western Bulldogs great Chris, and son of Jamie Grant who played five games for the Dogs. The family trees of this year's draft pool extend a couple of generations down the line. Tom Green, who is eligible to join Greater Western Sydney as an Academy player, is the grandson of Richmond team of the century member and triple-premiership player Michael Green. Jake Van Der Pligt, a prospect for the Gippsland Power, is the grandson of Des Meagher, a star of Hawthorn's 1971 Grand Final win who played 198 games for the Hawks.